More Portland Police bullsh*t: Video footage surfaces of PPD officers approaching Joey Gibson after arresting several Antifa, stating that they had probable cause to arrest Patriot Prayer members as well but had been asked not to. A lone wolf pack, so to speak. Rand Paul to vote for resolution against Trump's state of emergency. Twice a day a broken clock does something worthwhile? Rand Paul brushes his teeth and complains that it's slavery. I'm not sure where the label neo-Nazi applies. This is destructive nihilism on the level of the Joker. Given that a bunch of the organizations concerned are explicitly neo-Nazi, such as the ongoing murders by the Atomwaffen Division, and a number of others do things like attacking synagogues. Many of them are accelerationists who are trying to destroy society with the explicit idea that non-whites will be purged in the aftermath and a new white supremacist society will rise. Plus they're all far-right white supremacists who are frequently trying to kill Jews and start race wars, so at some point the exact label becomes academic. Thanks for the links. It certainly starts with neo-Nazi. I guess my point is that even hate organizations still have to live here. I don't at all want to make light of these would-be mass-murderers. But destroying civilization on the way to something better is more rapture/evangelical ideology. I'd say that just because they have to live here...doesn't mean they actually believe that they have to live here. There are enough people who either want to be martyrs or think that their Aryan blood will let them be triumphant after the collapse that it's not as much of a barrier as we might wish. Our society is absolutely awash right now in post-apocalyptic fantasies of the determined rising up from the crucible of the end. How many post-apocalyptic video games with that theme came out in the last month? There are lots of people steeped in this idea of mass death as a purifier for society. When 99% of a society scoffs or criticizes one's beliefs, it's easy to see how one would conclude that 99% of the population simply needs to die, because they're going to be in the way of implementing the 'correct' world order. Actually, I find the presence of "Additionally," to be sort of positive. He is accepting that perpetuating anti-Semitic stereotypes is not literally the same thing as questioning current U.S.-Israel policy, even if he does think that the latter is unacceptable (which I don't agree with). The pile on is unbecoming. I don’t really think this is anything new or unique to contemporary society. I don't even know what to say. The Democratic leadership are a despicable bunch. No, instead lets pile on the black muslim woman who dares to speak truth to power. Disgusting. Racism and bigotry is not a good look, Dem leadership. Look around yourself in the chamber and remember who the people elected. To be fair, the answer is "literally everyone in the room". Exactly the point. Punishing a member for not toeing the line is denying representation to Americans. APM Survey: What do Americans think about government funding and aid for public colleges and universities? 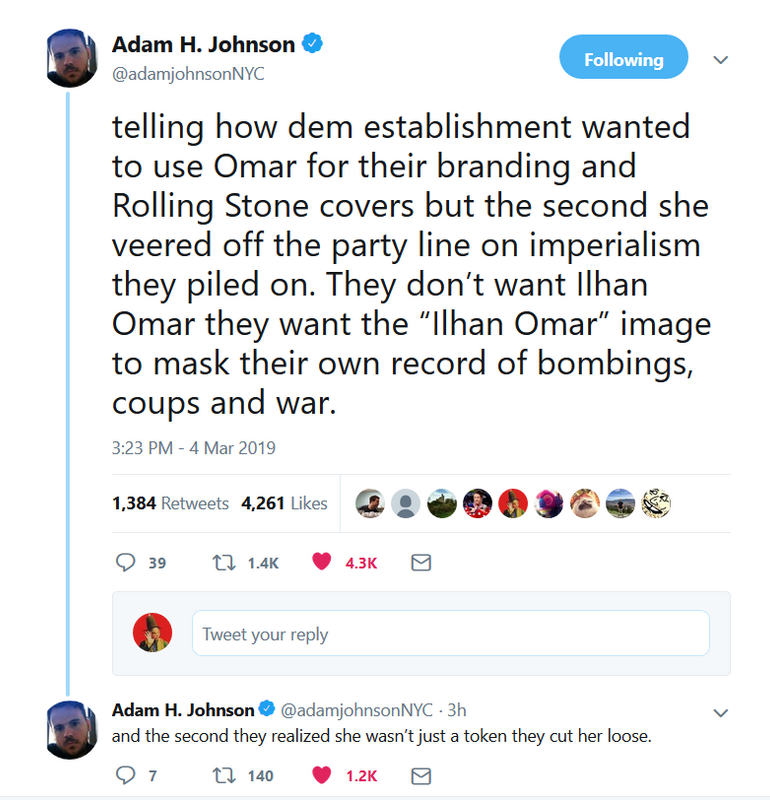 The sh*t that is happening with Ilhan Omar is ridiculous. She wasn't being anti-Semitic. Not in the slightest bit. In fact, I'd say this is both some good ol' racist bullsh*t because Ilhan Omar is dark-skinned and because she is rightly criticizing the lobbying arm of the corrupt Israeli government. Trump, Jim Jordan, Steve King, and so forth BLAST anti-Semitic remarks, but they don't get even a fraction of the attention. I wonder why. 1. Why is it necessary conflate your opinions on the Jewish religion with the actions of the Nation of Israel? 2. Where were these people when the PotUS said there were "good people" on both sides in Charlottesville? Well, you can be Jewish without being religious. Case in point my boyfriend is a Jewish atheist. But yeah, your point stands. Israel is a Jewish state, but it is not the Jewish people. Criticism of Israel is not criticism of the Jewish people. My boyfriend is deeply critical of Israel and their oppression of Palestenians. And yeah, where? All the outrage in the world over remarks that weren't even remotely anti-Semitic, but actual anti-Semitic incidents like "Jews will not replace us" or "Tom $teyer" are met with utter silence. 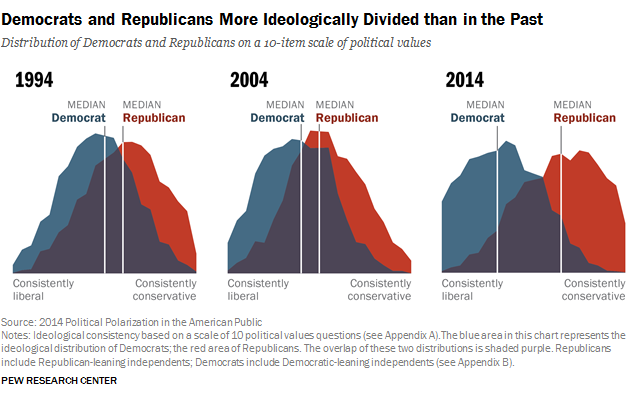 Americans are becoming more polarized, though. The issue is that a lot of the people who want higher taxes on the rich, paid maternity leave, net neutrality, etc. aren't nearly as politically engaged as people who are ideologically opposed to such things. And people who want those things also don't have the reach and resources of say, a billionaire, who funds a network of think tanks, advocacy groups, non-profits, and media outlets to champion their causes and can pull together hundreds of millions of dollars to back politicians who will agree with them. But the country is being held hostage by ideological extremists who primarily come from the political right. Hannity pulls just three million viewers a night--less than 1% of the country--and yet has a wildly outsized impact on politics. OG, you're arguing in favor of the article farley posted. The main premise of the NYT op-ed--that Americans aren't polarized--is false. We have become way more polarized (and that's largely due to the right deciding that MSM is fake news and that patriotz4merica.ru preaches the truth) and I'd guess that that polarization has increased rapidly over the past decade (especially the last couple of years). And behind all of that is the simple fact that a lot of things don't happen politically because those high poll numbers start to crater as they go from pie-in-the-sky idea to actual policy. Part of that can be attributed to manipulation, but America has long been a country where people want services and benefits from the government just as long as they don't have to pay for them (or that they aren't also given to people they feel don't deserve them).